Reviewing new material by bands that you've listened to for decades is sometimes a very slippery slope. On the one hand, it's a new release, so you review it as such. Or do you? How do you compare something brand new (and very seldom with the same musicians you loved) with something you've lived with for decades?? So that was my dilemma for this new JAGUAR CD. Since 1981 when JAGUAR was unleashed upon the world with the legendary Back Street Woman 7", these blokes were always one of the NWOBHM heaviest. In fact their Axe Crazy In Holland '82 concert has been credited by many as the starting point of Thrash Metal. Lofty expectations to be sure. And with any band around for decades, there is usually 1 captain who keeps the ship afloat thru it all. For JAGUAR, it's guitarist Garry Peppard. And the band he has put together for Metal X is 3/4 of the band that recorded 2000's Wake Me CD. That being Mr.'s Nathan Cox on drums and Jamie Manton on vocals. And joining them on bass is Simon Patel. So now that the introductions are out of the way, let's get to Metal X shall we? There's always that trepidation when the 1st track hits but WOW, "Warts & All" comes blasting out of those speakers and it's just a cracking track!!! A high energy number that even with JAGUAR's impressive catalog would be a brilliant opener Live. "New Tricks" is a tad slower but definitely doesn't lose any of the energy built up. Produced by Ben Turner in Bath, UK, the CD has a clean, crisp production and excellent guitar tone for Garry. "3 Minute Song" starts off ballad-like and in fact is a few ticks over 5 minutes long. I have to say that Jamie's vocals are easily the most surprising thing on the CD bar none. If you read my review of Brofest 2014 (Review HERE) then you already know my disappointment in JAGUAR's live set. But here, Jamie is a bit more reserved, not holding every note too long but belting out these tracks with a remarkable voice. Impressive! "Out Of Time" has a driving riff and the band is firing on all cylinders. Nary a plodding moment to be found so far. A great solo by Garry adds more flavor to this standout track. "Fair Wind Of Fire" keeps the fists pounding with more non-stop Metal! At 2:55, there's no time for a let down. "Day Of The Triffids" (a Sci-Fi movie Classic) sees the band keep delivering the blistering assault including a quick drum solo by Mr. Cox. "Moral Decline" just keeps the pedal to the Metal. No rest for the weary as they say. "Horse" is a tick below a full-on Thrash assault courtesy of a grinding riff by Mr. Pepperd and some double kick bass by Nathan. Jamie might be singin' to "Hold your Horses" but the band isn't listening! "Painted In A Corner" pulls no punches again and includes some nice bass runs by Simon. The CD pic shows him with a Rickenbacker and you can hear it in full effect on this track. Which brings us to the final track, "Stormchild 2014", a new version of the revered track from the iconic Heavy Metal Heroes compilation from 1981. Musically tight and not a bad job from Jamie but I much prefer the original version. But if you weren't fortunate enough to get that album or hear the original version then this is indeed the perfect way to end this CD. If you're looking for a legendary band just going through the motions or looking to grab another moment in the sun then perhaps you should look elsewhere. 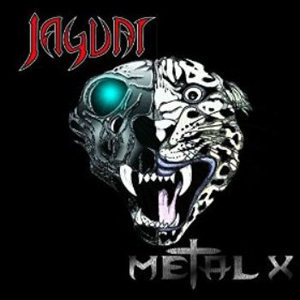 This is not an album by a band resting on their laurels but a contemporary Metal CD showing that legendary bands like JAGUAR, SAXON & SATAN are not only still making music, but making brilliant music that I think just adds to their legacy. Long live the NWOBHM!! All we need now is for Garry to get this puppy released on Vinyl!